Click here to enroll in the two day, Chicago, workshop for work/balance and innovative problem solving. Join us for the Customer Service Workshop on Friday or the PowerPoint Presentation workshop in the morning. Something magical happens with a LIVE workshop. It’s the experience, bonding, connection, interaction, discussion, perspectives, learning from others, making friends, sharing, and business/community building that demonstrates that you are not alone in your business issues, struggles, opportunities, and business decision making. A lot of the value from our workshops doesn’t come from your instructors but your participants. The investment is high but the results are greater. There is a deeper, more positive impact on the results. It is for that reason that we limit the total number of participants to 24 or less. We want the inspiration and perspiration to contribute to your personal fulfillment of your desire to succeed. This next round of workshops is for three days. Because you are reading my post I am offering a discount coupon for $1000 off each day as a thank you. — USE COUPON CODE SHWEBVIP If you are only interested in the November 15 event use the buy tickets ICON above. THESE WORKSHOPS WILL SHOW YOU HOW TO DISCOVER NEW OPPORTUNITIES USING EXISTING RESOURCES. It will help you get beyond the Work-Life Balance Myth to Personal and Professional Satisfaction. At the conclusion of this workshop you will be enabled to improve communications, create and lead effective meetings, investigate and rigorously evaluate ideas, manage risks, maximize opportunities, anticipate changes,and drive innovation, helping you overcome challenges. We understand that what matters most is contributing to your organization’s strategy and the bottom-line. Bring a real issue with you and we’ll help you immediately make progress on your challenges back at the office. We will provide a unique way to ignite your thinking patterns to overcome challenges, achieve goals, and solve problems. Get beyond the work-life balance myth to enjoy personal and professional satisfaction. Dan Brunnert (www.linkedin.com/pub/dan-brunnert/0/584/51b) will help create and sustain your competitive differentiation. Jim and Dan will lead a two-day innovation workshop at Merrill Corporation 311 South Wacker Drive Suite 1800 Chicago, IL 60606 -near Chicago’s Willis Tower. Jim will lead the PowerPoint and Customer Service workshops on Friday. With attendance limited to just 24 people maximum (Only a few seats left), the workshop offers an invigorating environment of interactive dialogs, case studies and projects brought by participants to develop, adapt and test business strategies. The program is designed for corporate leaders, entrepreneurs, small and startup business, and those responsible for driving top-line growth and promoting innovation, including marketing, technology and sales, as well as upper management. If you want to become better versions of yourself this is a must attend workshop. The vital link between innovation and strategy. 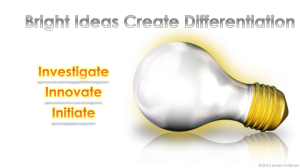 The four types of innovation and why you must have all four. How to identify the key obstacles to innovation. How to overcome challenges and deliver results. How to set goals, budgets, metrics and risk. How to equip your team with more productive Innovation Tools and Resources. How to use and maximize the benefits of the KnowBrainer Innovation Tool. How to balance your work/life. How to free up personal time and energy. Because of limited attendance, those wanting to attend are encouraged to click on the photo of the light bulb at the top of this page to go to the shopping cart to register. Here’s more details on what we will cover in the four half day demonstrations. Know Your Brain. Understand work/balance. We will give each participant a picture of their thinking style preferences and point the way toward working together more effectively and productively. The process will give everyone a chance to get to know each other, experience the differences in thinking style, and an understanding and acceptance that there are no right or wrong thinking style preferences. This interactive process offers you the choice of how to determine who you are, how you function, and how you interact with your associates, friends, and family. At the conclusion teams will be formed to work together for the Idea Exchange and other activities. We will address the number one issue plaguing employee satisfaction: work/life balance. This portion of the workshop is designed to help participants get beyond the work-life balance myth and identify practical ways to increase personal and professional satisfaction. This powerful workshop dispels several myths about the work-life issue and presents practical tools and systems to help people achieve lives that are both personally and professionally satisfying. Why some groups work well together and others don’t. Why some groups are more productive and fun to work with and others are non productive and boring. Why the same person can do extremely well in one job and poorly in another. How to use and maximize the benefits of the KnowBrainer. #4 will address YOUR questions and offer an Idea Exchange that will develop better, faster, and smarter solutions to YOUR organizations problems. Each person will leave with the collective solutions provided by two intensive days of ‘brain storming’ and ‘creative problem solving.’ The pre-workshop questions will be identify a primary goal, challenge, problem, or opportunity and the participants will brainstorm ideas and connections relating to your goal. A single solution that is actionable may be worth more than the modest fee. With attendance limited to just 24 people, the workshop offers an invigorating environment of interactive dialogs, case studies and projects brought by participants to develop, adapt and test business strategies. Continental breakfast, snacks throughout the day, unlimited soft drinks, water, coffee and tea. Catered lunch. Workbooks. KnowBrainer, Shift Happens!, and Off Balance book copies will be provided as well as other tools. Jim will discuss how to WOW instead of WHY your customers. He will discuss the Customer RETURN Policy, the internal customer as well as the external customer. Because of the small workshop size, individual questions and personal concerns will be addressed. This is an interactive workshop. It is a discussion about how to WOW your customers. Customized education for each attendee will address specific issues, products, services, concerns, and solutions. You will learn the power of why and the most important questions to ask your customers: DYPII and DYPIH. Store returns and other customer service requests are a fact of life. No matter what you sell, people will want to return things or have issues with their performance. If you want to WOW them instead of WHY them, if you want to create a customer return policy that has one goal, to get the customer to return, then join us for a full day of straight forward and simple, processes that will deliver an exceptional customer experience that will have a positive affect on your bottom line. This is for any one that deals with customers. Jim has presented the D-A-T-I-N-G concepts to BASF, Hyatt Hotels, Toyota, Apple, Microsoft, AT&T, Marriott, Ritz Carlton, Ford, Nissan, Xerox, Rotary One, Cardinal Healthcare, Wynn Las Vegas, San Juan Convention Bureau, Kempinski Hotels, Los Cabos Tourism Bureau, Carnival Cruise, etc. The small investment in this workshop will bring you a substantial ROI…Return on Your Ideas that you can implement in any size organization. You want the truth? Can you handle the truth? 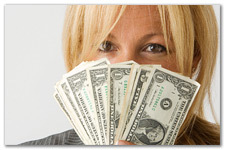 This workshop will help you with ENLIGHTED WEALTH. Wealth is not wealth without the money component. We understand that presentations are not just about the slides. It’s about selling an idea or concept. It’s not creative unless it sells. Setting a Clear Objective with 3 critical questions. The insight mining process to create Leaders and Clarifiers for a clear presentation story. How to use pictures and visuals in the right way. Using simple comparisons i.e. Analogy to make complex business ideas simple and memorable. Rules to present Graphs and information to ensure credibility and audience attention. Cutting the Clutter in Slide Layout. Understanding the language of Colors. 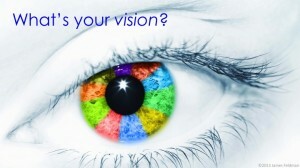 Using Visualization to gain confidence. This workshop has been used to train professional speakers, managers, and trainers. It has been refined multiple times to ensure practicality, effectiveness and engagement. Jim will provide hands on assistance to provide insights to WOW the audience with your presentations. Engage audiences of all types (Visual, Auditory or Kinesthetic) every moment with insightful analogy, visual slides, exercises and examples at every step. You can use this content for a variety of programs including train the trainer program, facilitation skills course, presentation skills program or advanced communication skills program for managers. Just ‘cut-paste’ the segment you would like to integrate with your training. It is ready with presenter notes. So you can run a presentation skills program very quickly. Get appreciation from your audience for the insightful and practical training content. More than anything else, this training program contains unique aspects like the process of mind mining to generate ideas, the process of using analogy to make complex ideas simple and a matrix to understand body language. The creative topics and the practical step-by-step explanation ensures that your audience will derive value from your training. It is an intensive learning program, that brings a visible difference to your business presentations. Project updates to your colleagues. 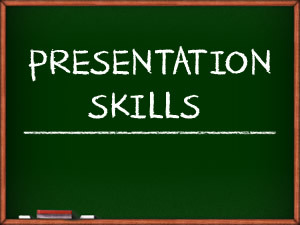 This practical presentation skills workshop will help you take your presentations to the next level. In this workshop, you’ll learn a step-by-step process to create remarkable presentations that gets you results. Jim started making 35mm slides for clients in 1972. He has presented over 1000 presentations and each one leaves the audience with wanting more. If you want to break the handcuffs of business as usual thinking and move to innovation as usual bold ideas to drive change through your organization you can’t miss this workshop. Space is limited. Sign up today to reserve your seat. Money back guarantee.